France is a country associated with love and wine. Saint Valentin, a village in the center of the Loire Valley is known as the “Village des Amoureux” (village of love) and where a Valentine’s Day festival flowing with wine and food is held annually for several days in February. The Paris High Court of Love established in 1400 dealt with the important love contract. And simply strolling through a vineyard, or along a river at sunset can make you fall in love with this country. 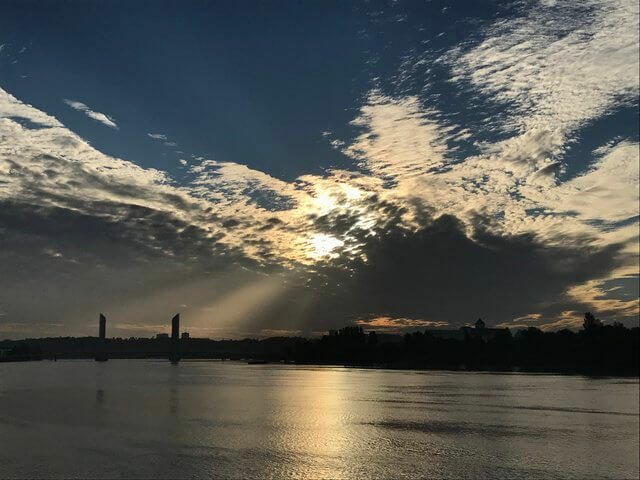 Sunrise over the Garonne River in Bordeaux. The Jacques Chaban-Delmas bridge is in the background. Walking through a fog topped vineyard in Saussignac AOC one morning. It was a beautiful sight! This month the French Winophiles focus on L’amour– French wines with a name or concept reminiscent of love. We are a group of wine writers and bloggers that love French wine. Each month we focus on a different area or aspect. 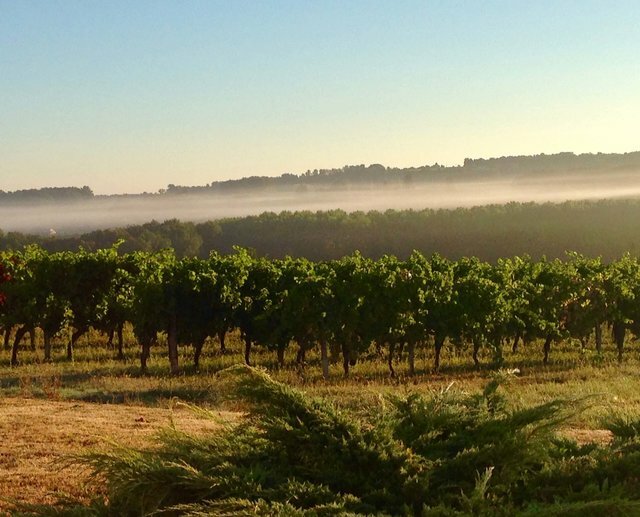 From food and wine pairings to wine travel, and regional wine history to area wine basics, we’re passionate to learn, write about, and share French wine with you. This month we’ll share special wines. From Côte-Rotie to Saint Amour, Fleur du Jacquere to Loire Rosé and more, “ces vins de france sont ravissants!” (these wines of France are lovely). We virtually congregate on Twitter the third Saturday each month. This month it’s Saturday, February 17th at 11 am EDT / 17h in France. We invite you to meet us there using the #Winophiles hashtag. Everyone is welcome, whether spectating or joining in by commenting and/or asking questions; just be sure to use the hashtag #Winophiles within your tweets so we can properly welcome you! Contact me to tell me you’re in: Include your blog url, Twitter handle, and any other social media details. We like to know who’s participating to include you and give shout-outs along the way. Contact me here . Send your post title to me by Wednesday, February 10th to be included in the preview post. I will prepare a preview post shortly after getting the titles, linking to participant blogs. Publish your post anytime on Wednesday, February April 14th. Include links to the other #Winophiles participants in your post, and a description of what the event is about. I’ll provide the HTML code that you can easily put in your initial post — which will link to people’s general blog url. Get social! After the posts go live, please visit your fellow bloggers’ posts to comment and share. We have a Facebook group for participating bloggers, too. If you need an invitation please let me know. Thanks for stopping by Katarina, and have fun at Anteprime Toscane this week!